Smell something smoky? 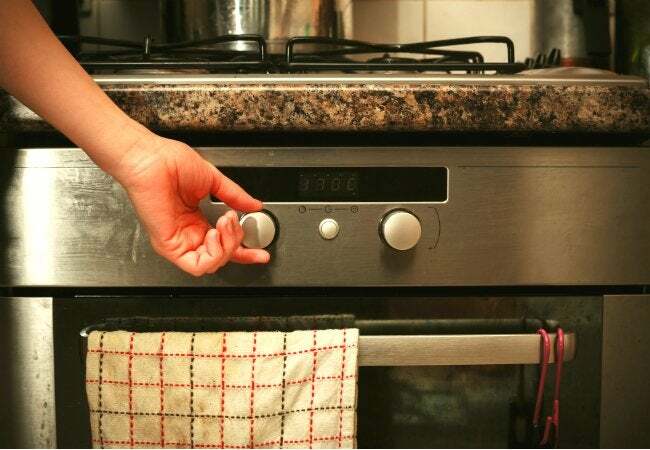 Check your oven. Spills and splatters from long-gone casseroles could be to blame. Roll up your sleeves and follow this step-by-step to get your oven back to working order. You’ve put it off for months, hoping the little spills and splatters inside the oven would vanish of their own accord. There comes a time, though—as much as you wish it weren’t true—when you must clean an oven to ensure its continued operation. Of course, that’s assuming you don’t have a self-cleaning oven. These marvelous inventions have been around for a number of years. They maintain themselves by heating to an extremely high temperature that burns away residue. Older appliances are not so conveniently equipped. But by following the instructions detailed below, you can clean an oven completely in only a handful of steps. Start be removing the oven racks. These may need to be cleaned, too. The most effective method of cleaning oven racks is to give them a good, long soak in hot, soapy water (liquid dish soap or a crumbled dishwasher tablet ought to suffice). Can’t fit your oven racks in the kitchen sink? As an alternative, you can soak them in the bathtub. Just be sure to line the tub with an old towel so as to prevent the metal racks from chipping or scratching the delicate finish on your tub. Within the oven itself, use a metal spatula to gently scrape away residue. The sides of the oven may be messy too, but most of your effort is likely to be spent on clearing ashy chunks off the bottom of the oven chamber. Most baked-on spills and splatters can be removed this way, but you’re not finished yet! Mix baking soda with just enough water to create a thick paste. A typical ratio is one half-cup of baking soda and two or three tablespoons of water. 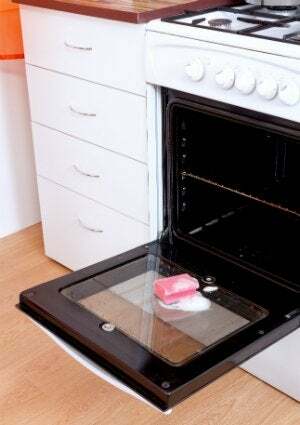 Apply the paste to every surface inside the oven, including the back side of the door. Let sit for several hours or overnight, allowing the paste to penetrate deeply. Once six or eight hours have gone by, lay old newspapers or paper towels on the floor in front of the oven. Next, using a slightly moist sponge, wipe out as much of the paste as possible. Lots of grease and ash should come out along with the paste. Continue wiping, rinsing the sponge as necessary, until no more paste remains in the oven. If the chamber still seems dirty, you may want to repeat the process, reapplying the baking soda and letting it sit before attacking the oven with a sponge yet again. Fill a spray bottle with a 50-50 mixture of white vinegar and water, using it to spray down the glass portion of the oven door. Wipe away the moisture with a clean, dry cotton or microfiber cloth. In the future, to make oven maintenance less of a time-consuming chore, why not regularly wipe down the oven chamber with soapy water? If you stick to a program of more frequent, less intensive cleaning, your oven may never again need such major TLC. Hey, it’s something to think about, at least!